Antarctica: How Long Can It Remain "Unowned"? However, that could soon change. With the 2048 renewal date for the Madrid Protocol fast approaching, there are already signs that countries may be vying for possession of territory there. Complicating this issue is that as the climate continues to rapidly warm, oil and gas deposits that Antarctica may have—first hinted at in the 1970s—might finally be able to be extracted. The energy needs of the world are increasing. Is thinking that a whole continent can remain dedicated solely to science now unrealistic? Antarctica is to be used for peaceful purposes only; no military measures are permitted (the treaty does allow, however, some commercial activity: fishing is permitted in certain areas of the Southern Ocean and tourists can visit Antarctica, as long as their expeditions are approved by their national Antarctic programs). Nuclear explosions or dumping of radioactive wastes are banned. There is complete freedom of scientific investigation and cooperation. Claims are “frozen”; no new or enlarged claims are permitted (15 percent of Antarctica is still unclaimed). It does get tricky here: while the original claimants are the only nations allowed to have claims, they can’t assert them. So if, for example, Sweden wants to build a base, it can go to the treaty nations as a whole to present a proposal. A decision-making role is held only by nations carrying out substantive scientific research activity. Today, more than 45 nations are signatories. In 1991, the Protocol on Environmental Protection to the Antarctic Treaty (also known as the Environmental Protocol or Madrid Protocol) was adopted. It entered into force in 1998, and it is the main instrument concerning conservation and management of biodiversity in Antarctica. Notably, it prohibits mining. If requested, however, in 50 years time a review conference could decide to modify the mining prohibition, provided that “at least three-quarters of the current consultative parties to the Antarctic Treaty agree, a legal regime for controlling mining is in force and the sovereign interests of parties are safeguarded.” That 50-year term expires in 2048. Back in 2007, the United Kingdom made a submission to the United Nations for sovereignty of 386,000 square miles of seabed off Antarctica, some say in defiance of the spirit of the Antarctic Treaty. While it is too difficult to extract any useful minerals from that area at the moment, technological innovations and environmental changes due to climate change in the Southern Ocean could make drilling an economically viable activity within a few decades. Recent events such as these have given rise to the fear that countries are subtly working to position themselves for that moment in 2048, when the consultative parties may revise the Madrid Protocol. They point to China, which has already built four Antarctic research stations and has scouted the construction site for its fifth. And the United Kingdom and Argentina continue to have diplomatic tensions over the Falkland Islands. Who owns Antarctica? Right now, it could be said, that the penguins and the ice shelves do. But that might soon change. Do you think that Antarctica should or even can continue to be the Earth’s only continent unowned and dedicated solely to science? Or will the Antarctic Treaty and its Madrid Protocol need to be updated to reflect our current economic times? Both arctic and antarctic should be left untouched. no human interference should be allowed in these regions. Much will depend on legal concepts from centuries ago. When Spain was at the peak of its power, it declared that the Atlantic was a Spanish sea. The Dutch philosopher Hugo Grotius wrote “Mare Liberum” which asserted that THE SEA BELONGS TO ALL. That led the ascendent British to claim that THE SEA BELONGS TO NOONE. 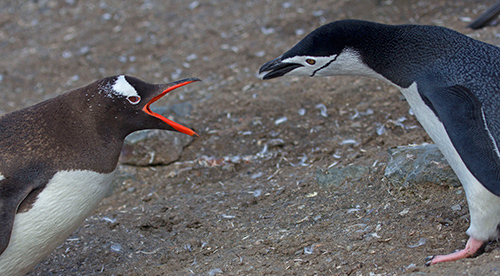 While Belonging to ALL vs. Belonging to NO ONE may seem to yield the same result, there is an important distinction that will also affect Antarctica in future decades. If the Seas (or Antarctica) belong to no one, then anyone can claim and exploit them. The strongest, boldest nations will take over. Other nations will not share any of the benefits or control. But, if the Seas (or Antarctica) belong to All Nations, then any resources taken would have to be shared among all nations, and control would need to be shared as well. The All vs No one question has already been debated with regard to the deposits of manganese nodules in the Pacific. If–as we hope–the Owned by All side prevails, then further questions will be raised. Do the few close nations (Chile, Argentina, New Zealand, and possibly Australia and South Africa) have additional rights and responsibilities due to proximity? Chile and New Zealand have long been important to supply the bases, to provide flights and to patrol the waters around the frozen continent. Do the three super-powers (US, Russia and China) have any special role due to military might? Do the first to explore the area (Britain and Norway) have any additional claim? And, as one person has commented, there have been several babies born in the sector of Antarctica claimed by Chile. Does this birth right strengthen Chile’s claim? I have been to several of the Antarctic research bases, and was impressed with the high level of cooperation among the researchers. Any areas where solid rock is exposed will have many research stations clinging to basaltic outcrops. The mail is taken out by air from the Chilean Eduardo Frei base. If you need a dentist, one comes over from the Chinese Great Wall base. If sin and salvation is on your mind, you can visit the Orthodox priest at the Russian Bellingshausen base. (Everyone speaks English). If there is no oil to be found, then it is likely that peace and scientific cooperation will prevail (The Sea and Antarctica will Belong to All). Yet if oil is discovered, it will be gunboat diplomacy a la The Sea Belongs to No One. A third possibility is that there will be a melding of existing claims with military might. The US works closely with New Zealand at McMurdo. The Russians cooperate with South Africa. The Chinese and British both work with Chile. We could end up with an amalgam of “rights” and “might” to buttress claims for a US/NZ sector; a British/Australian sector; a Chinese/Chilean sector and a Russian/South African sector. Excellent proposition which needs to implemented. Unowned? My understanding is that it has already been divided up. Talk to those who think they own it – Australia included. The polar circles are more than heritage environs for the mankind. Both Arctic and Antarctic continents belong to the world community sans borders. In fact, gaining ownership in the already battered Antarctica (Ozone hole is expanding) will lead to fast depletion of bioresources (including the krill) and fossil fuel reserves. Human greed has no limits. Possessing rights will change the very complexion of the pristine conditions. In fact, our climate regimes are partly dependent on the glaciers and ice caps of antarctic continent. I would rather like the issue deferred till we run out of resources from the continents that we have already populated. It is NOT a NO MAN’s land but ‘EVERY ONE’S PRIZED POSSESSION. There is a chance for either annexation of Antarctica or the “BIG, DEVELOPED, RESPONSIBLE” countries would share the land among themselves for the natural resources. I firmly believe that man, left to his own devices, will ruin yet another part of this planet we call home. just because they have been fishing there for years. that happens to be a lot of countrie’s mind set. of Mexico is like saying the UK should have rights to Antarctica. Please keep in mind this is only an analogie Science should be the only reason for any country to be there. 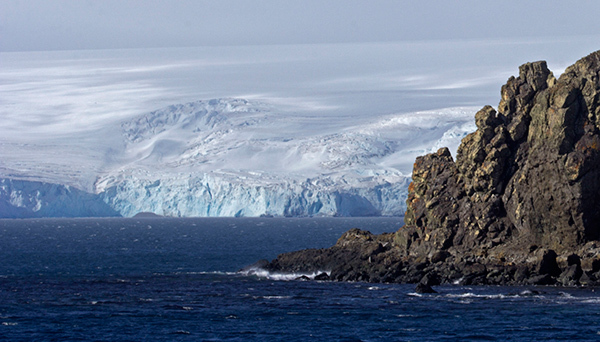 Antarctica, the last great wilderness on Earth, should be left untouched forever. I went there with Robert Swan, the only man to have walked to both the poles, and a man who has made a personal 50 year commitment for the conservation of Antarctica. His organization 2041, reflects the year in which the treaties that ban mining and drilling activities at Antarctica will come up for review. 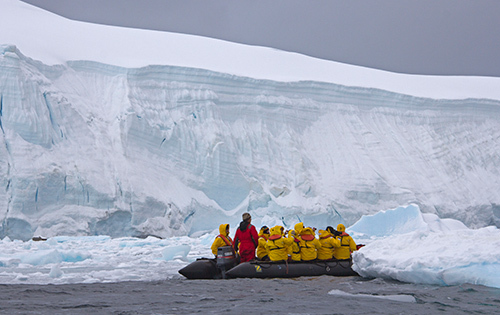 Robert Swan & 2041 has been organization annual International Antarctic Expeditions to educate young people and empower them to influence and take informed decisions about the fate of Antarctica when the treaties come up for review. Exploiting Antarctica will be the last nail in the coffin for the planet and human civilization will be unable to cope with the the catastrophic rise in global sea water levels and spiralling warm weather events. After travelling to Antarctica, I have been inspired to train myself and then make presentations about effects of climate change and the solutions available for government, corporates & individuals to make a difference and help win the war on climate change. You can see the difference between the pristine Antarctic Peninsula and King George Island, which houses the bases of several countries; the touch of humanity is clearly evident, with trucks, dogs, and non native vegetation scarring the white continent environs. It’s unowned, but we can’t support some countries that are giving the land to there Queen (UK), this is totally crazy, they are so far from the Antartica and they wanted the same Land than Chile and Argentina. In fact, Chile it’s the only countrie that have a real antartica’s inhabitants and some chilean citizens that have born in the antartica. Sorrie for my bad english. Hi Candice. I strongly believe that Antarctica should remain only for science/ environment etc studies, are they really going to put their hand on this continent for oil and gas? it is really greedy. The Antarctic Treaty of ~1962 sets aside all previous national claims to slices of territory as well as setting aside the whole continent for peaceful scientific research. For as long as its in place, ‘ownership’ of territory and/or resources remains undetermined. Which is probably the best option presently. While much is said about extracting oil/gas/minerals etc., the moving ice sheet of a few miles thick over most of the continent and out to sea, the climate, the weather, the remoteness, lack of supplies and services, enormous icebergs drifting at a few knots of speed, the stormiest seas on the planet surrounding it, etc. make exploration never mind extraction and transportation back to civilization, extremely difficult and probably cost-prohibitive presently. Antarctica should continue to be a place for science for indefinite period. For its greed, mankind had already damaged the environment over most part of our mother earth. We certainly need a place where the science can be done without interruptions. When you look at how many ‘research stations’ are there on Antarctica, the one would doubt if Antarctica can really be “unowned”. Some nations have already divided the land and nearby ocean into different for various purposes. I guess peace at Antarctica would remain till someone extract valuable resources successfully. I do believe that there is an international agreement and treaty that no one will control the continent. My opinion is it should remain unowned and be declared as a protected environment where no commercial fishing, no whale-hunting no drilling or extracting of natural resources is allowed. Scientific research teams should be allowed to continue to perform their research and experiments without any hindrance. The nations closest to Antarctica, that is Australia, New Zealand and Chile should be the patrons for this so-called natural reserve and in a joined mission make sure that this area of the world remain a clean, non-volatile, unique and pristine environment for the coming generations. Yes, it should remain unowned, but unlikely it will. There are already aspects of “claim” on territory – a number of nations fish heavily in areas that would be considered “territorial waters” of antarctica, and when attempts are made to extennd environmental protection zones contest this by asserting that as they have fished there for considerbale time they have established a “right” to do so – this is effectively asserting some sort of ownership. The countries who have research facilities on the continent have their own “zones” and several, mostly the USA, actually protect these by intercepting any “unauthorised” trips into these – and in the case of the USA they maintain a military presence in antarctica. All that sounds like asserting some form of ownership, or at least establishing precedents on which they can later build ownership claims.